Last Sunday at the bookstore, Vin and Charles tell me that Sage has her first must-have CD. It turns out that while perusing the selections, Sage stumbled across the listening earphones and plugged in to Natalie Imbruglia's Glorious: The Singles 1997-2007. She was mesmerized by the singles "Glorious" and "Torn" and "That Day" and shooed away another girl who dared to look at the CD. Before we left the store, she asked me if she could have the CD to listen to. I realized then that this was the first real music CD she had ever asked for (not counting the soundtracks of various Disney & High School Musical films that I bought both for her and me - the HSM videoke album is my fault, completely). She had no "music" of her own, outside of songs learned in school, listening to whatever I blasted out of the iPod (hence her love for the Rolling Stones's "Satisfaction") - this was the first music she decided on her own (I hadn't heard "Glorious" though I do love "Torn"). So of course I got it for her. Her joy was doubled when we found out that the CD came with a DVD full of videos. And now I need to borrow her CD so I can rip it for my iPod. Nikki and I would like to you invite you to the book launch of Philippine Speculative Fiction III. It will be on December 8 at 4PM at Fully Booked Bonifacio High Street - just head on down the basement theater. 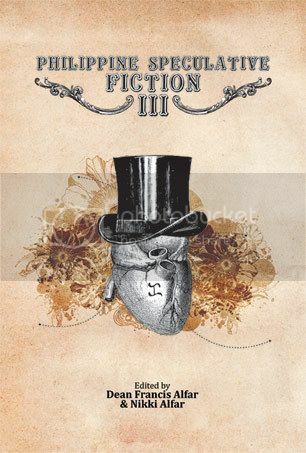 The anthology, third in an annual series, showcases the literature of the imagination from Filipino writers living in the Philippines and abroad. We made sure to select wonderful pieces of fantasy, science fiction, horror and other things in between, and are certain you will find something to your taste. PSF III's roster of writers includes first time authors as well as more established ones - and we had the toughest time determining the final table of contents (and had to pass on a number of excellent pieces which we are sure will have no problem finding a home in a magazine or another anthology). Make sure you're there to celebrate with us! 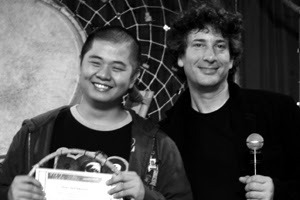 Sunday evening, with Neil Gaiman as special guest, Fully Booked announced the winners of the prose and comics competition for the year. I was there with my co-judge Tony Perez (the third judge, Peque Gallaga, was out of town). After the deliberations, we were happy with all of our choices for prose. I was delighted to be a judge because of my love for speculative fiction, and glad that all three of us judges agreed on the winners. 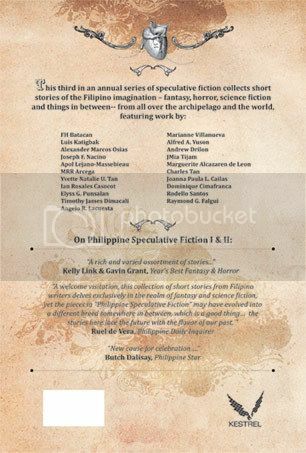 It is icing on the cake for me that three of the four winners are all appearing in Philippine Speculative Fiction III (the launch, by the way, is on December 8, 4PM, at Fully Booked Bonifacio High Street – at the theater in the basement; you are most definitely welcome to join the fun!). Joseph Nacino took 1st prize and P100k with “Logovore”. 2nd prize was a tie: Ian Rosales Casocot, last year’s grand co-winner, with “The Sugilanon of Epifania’s Heartbreak”, and Yvette Tan for “The Bridge”. 3rd prize went to Erin Chupeco for “Juan Perez’s Corpse”. 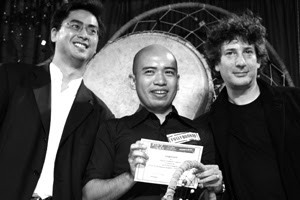 In the comics category, judged by Leinil Yu, Arnold Arre and Jaime Daez, no award for 1st prize was given. 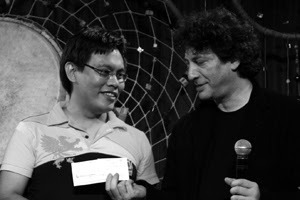 Andrew Drilon took 2nd prize (which had all of us giddy and lightheaded). I wasn’t able to take down the names of the other winners (sorry) but I’m certain that the Fully Booked site has the official list. Congratulations to everyone! During dinner with the winners, judges and the organizers, Neil graciously sat at our table (me, Nikki, Andrew, Ian, Joey, Mia, Huebert and friend) towards the end of the night and gamely answered all the questions I lobbed at him. Earlier on, I had some alone time with him and told him how wonderful it was to finally literally stand next to him – since our previous “sharing of space” was literary, when one of my stories appeared with one of his in the Datlow/Link & Grant Year’s Best Fantasy & Horror (I know, I know, such a fanboy, but what can you do?). He is a wonderful interview subject and peppered his answers with small anecdotes and much good humor. 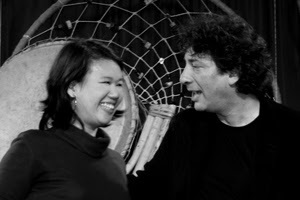 I asked him why he moved to the States (he and his family needed more room during the housing bubble in the UK + the weakening of the dollar + the appeal of the Addams Family-type house near his wife’s family in Minneapolis), what his writing process is like (work at it), how he shifts gears between the different types of fiction he writes and the audience he writes for (in the case of “The Sunbird” and the new graveyard story, just trust the story and find the audience later), how much a writer like him makes writing for comics (when he started with Sandman, it was US$50 per comic page, now he commands the top rate of the publisher plus 50%), stuff about Sandman, why he didn’t write more than one comic book title while he was at Vertigo (he’s a slow writer, taking one month to write each issue of Sandman; and he would rather do one thing very well than have more – but mediocre – output), what the structure of the new graveyard novel is (each chapter progresses two years) and so on. He told us about how baby elephants are trained, how he develops stories for anthologies, how sometimes a story he’s written and sold (in this case to the BBC) is not as wonderful as he initially thought, how impressed is he with us Filipinos, how he is able to live off royalties, and more. I told him about the state of spec fic in the country and how thankful we are for the support and encouragement of people like him. At the end of impromptu interview (when my guilt at hogging him from everyone else finally, finally, took hold), he said that we should come up with a really thick Year’s Best Fantasy, Scifi and Horror of the past several years. Okay, then. It will be so. Ian and I and maybe one more editor should do the trick. What a great evening, more than making up for the uncommon stress of the previous week. It was wonderful seeing so many young writers and comic book folk again (the energy is infectious). Oh, and to cap off the evening, Mia Tijam asked if I was aware that “Chasing Aurora” appeared in today's Sunday Inquirer Magazine. I wasn’t, but was happy anyway (on the way home, after frantic stops at various 7-11s, Mini Stops and Coffee Bean & Tea Leaf, I finally secured a copy). After a particularly stressful day yesterday, I was hoping for a little relief. Events made me reconsider how people approach relationships. Things that happened saddened and drained me. I'm getting tired. At the end of the day, I couldn't wait to get home to Sage (and we told each other stories, hers funny, mine bittersweet). A little bit of cheering myself up then. And Salamanca is shortlisted for the Madrigal-Gonzalez Best First Book Award. I'll be chairing (and acting as the rapporteur for) the panel on “Philippine Literature in the Post-Modern Age” scheduled on December 9, 2007 (Sunday) from 10:30-12:00 noon at the Ablaza Hall of the National Art Gallery of the National Museum of the Philippines (along P. Burgos Street in Ermita, Manila). We have a great panel filled with interesting and accomplished folk: Charlson Ong, Vim Nadera, Krip Yuson, and Carlo Vergara. Expect funkiness as we explore the topic, from comic books to performance poetry to speculative fiction. It's literally a Who's Who of wordsmiths, including F. Sionil Jose, Bienvenido Lumbera, Malou Jacob, Marjorie Evasco, Frank Rivera, Cirilo Bautista, Ricardo de Ungria, Merlie Alunan, Cristina Pantoja Hidalgo, Jaime An Lim, Amelia Lapena-Bonifacio, Leoncio Deriada, Rosario Cruz Lucero, Wendell Capili, Ian Casocot, Butch Dalisay, Mike Coroza, Jose F. Lacaba, Rody Vera, Ophelia A. Dimalanta, Gemino Abad and many other sterling creatives. "The River Stone Heart Of Maria Dela Rosa" appears in the latest issue of Serendipity. Putting together the annual PSF is always enjoyable (which means that I find the accompanying stress enjoyable), in part because I get to read a lot of new stories. This year, as a judge for a P100k spec fiction competition sponsored by a big bookstore, I get to read even more. I'm reviewing all the contest stories and will soon deliberate with the two other judges. I'm happy to say that the Filipino imagination is not just alive but happily skipping around. I'm familiar with a number of the submissions - I received them for my antho but had to decline for one reason or the other. I did encourage the authors to enter various contests and I'm glad they entered their stories in this one. At this point there are already a handful of beautifully imagined and written stories that have made an impression on me. But, as these things go, I need to see what my co-judges think. The last batch of Filipino speculative fiction I expect to receive this year will be LitCritters originals. As I announced at Serendra (and on the LitCritters list), I'm pushing for us to be more prolific, to be "working writers" which means writing more and writing better. We'll work out a critique schedule for selected stories as we continue to expand. Capping off my hectic week of presentations and pitches was another presentation - this time about writing the novel. And yes, this was the one I enjoyed most. I was invited by Read or Die and the UP Institute of Creative Writing to be part of Write or Die. WOD is a series of lectures on different aspects of writing: for the novel, there's me, Charlson Ong, Jun Reyes and Amelia Lapena-Bonifacio, all at Powerbooks. One of the goals of WOD is to promote the UP Gawad Centennial Likhaan 2008, a special set of awards to be given out next year (and the huge prize money - P200k for each category - is incredible!). Anyway, I had a great time sharing my own process (remember: description, not prescription) and hopefully, I was able to encourage some members of the audience to go for it. I said a lot in two hours, so for those who have been requesting for my presentation, here it is (Dean's Novel Presentation). Please note that these are only my talking notes. Also, the incredible Charles has put up an audio recording as well as a partial transcription of my talk (warts and all, LOL) over here. 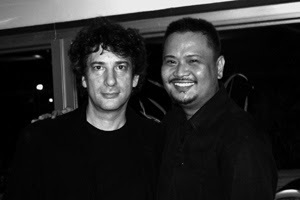 And since I wrote Salamanca as part of NaNoWriMo in 2004, it was great to meet the Pinoy NaNoWriMo folk. Thanks to Kyu of Philippine Genre Stories and The Lit Critters for being there for me (Vin especially for helping with my laptop and Alex for the timely hand-raising). I was pleasantly surprised by Ichi Batacan - one of the Filipino novelists I admire (go and read her "Smaller and Smaller Circles"). One of her stories appears in PSFIII. With covers and layout complete, we've turned over all the digital files and guide print outs to the printer. We expect to see cover proofs and the blueprints of the inner pages by this weekend, so we can make final corrections or adjustments. After that, we'll give the go signal for printing and the next time we see the stories we've been working on, they'll all be in a book. Then we'll have the book launch at Fully Booked Bonifacio High Street on December 8th, continue marketing and selling the book to the bookstores, take time off, and begin the process for Philippine Speculative Fiction IV. On reflection, it's hard to believe we'll have the third volume out by next month. Has it been three years already since I first began? If you haven't read Andrew Drilon’s Kare-Kare Komiks, well, you should. Lots of people reading his feature in the Philippine Daily Inquirer certainly will. Here's to my fave mentee! A big thank you to everyone for your comments and input. Here are the final covers (front and back). You'll note that we kept the top hat and added an alibata character. The name of my extremely talented designer is Paolo Dizon, by the way, and I'm very proud of him. Kudos to Kenneth Yu of Philippine Genre Stories! His story "House 1.0" appears over at The Town Drunk - go and read.